In the wake of the current economic recession, which is biting hard on Nigerians, the Federal Capital Development Authority, FCDA, has embarked on a demolition exercises in the popular business area of Wuse 2, Abuja. The demolition which was carried out on Wednesday, September 7, along the popular Aminu Kano Way, has left several businesses losing millions of Naira in the process. Owners of the shops however, lamented that only a 24-hour notice was given to them, before the demolition process. While other shop owners are angry and busy picking what they can lay their hands on, a shop owner who spoke to Post-Nigeria said, “The buildings were marked 12 pm on Tuesday, and demolished by 10 am on Wednesday”. 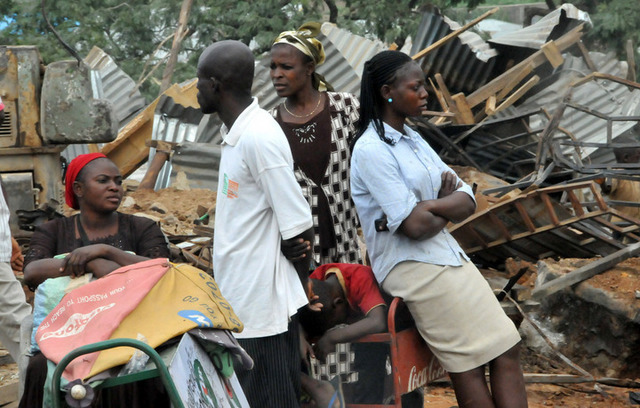 Elsewhere, the demolition sparked reactions from onlookers, who gave various reactions over the decision of the Minister of the Federal Capital Territory, FCT, Mohammed Musa Bello, to cause more hardship on Nigerians. “Is this the change Buhari promised us? “FCDA have been unable to restore street lights in the same Aminu Kano road, but they can demolish buildings where people get little to feed their families”, an onlooker emotionally lamented. Another passerby said, “How will this demolition restore the economy now? More depression for people, More hunger and unemployment for Nigerians”. While the reason for the demolition remains unclear, the demolished site is a major business area in the Bannex area of Wuse 2, Abuja.